This involves checking baked goods to see whether they are completely baked through. 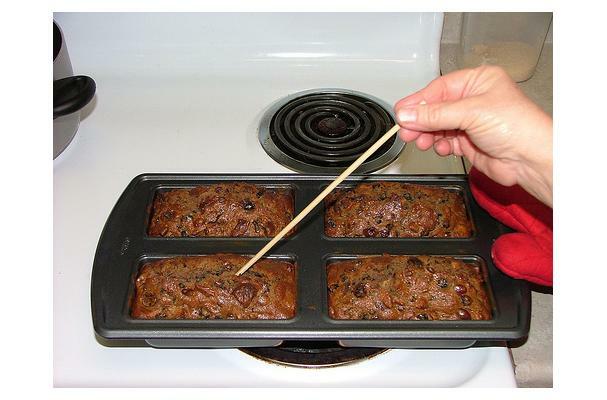 The most effective way to do this, is to use a wooden skewer or toothpick and insert it into the middle of the cake or bread. If it comes out clean it is done, if it comes out wet, then the cake is not ready. Brownies are one exception where a few moist crumbs on the toothpick indicate they are finished baking. Sponge cakes can be tested using the fingertips. If the top springs back and no indentation remains after the surface has been pressed, then the cake is done. You can also use an instant-read thermometer to check for the correct temperature. Bread recipes are beginning to include the optimal finished temperature to tell when it is baked thoroughly.